I greatly appreciate your participation in the 2017 show and look forward to your prompt renewal for 2018. If you have any questions or need any additional information, feel free to call, text or email me. Your first rights to renew your same location expire soon. I've expanded the map as well which opens up some new space. So, please let me help you get the best location possible. If you need to secure your booth in the 2018 Spring Home & Outdoor Living Expo first, then click here. We are excited to announce that we have secured a much better date for 2018. The new weekend is 2 weeks earlier in the month of November immediately following the Arabian Horse Show. The biggest uncontrollable condition we've all had to contend with in past Fall Home Expo's has been the congested parking near our building as attendees of Affair of the Heart and the Wrestling Tournament in the Pavilion have pushed right up against the Exchange Center. As these events begin earlier in the day on both Friday and Saturday, their folks filled our spots and then stayed there for long periods. This effectively blockaded the parking nearest to the Exchange Center and depressed our potential audience. Instead of battling for parking on one of the busiest weekends, we will now be the ONLY active exhibit building on Expo Square as the others are being cleaned up from the Arabian Horse Show. Every past exhibitor that I've discussed this with in person has agreed that this is the BEST NEWS I could possibly have going forward. I hope you agree. 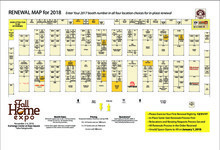 The 2018 Fall Home Expo booth map has been expanded. All unsold space becomes available to late renewals and new exhibitors on 1/1/18. Download "FHE18 Booth Map Initial.pdf"